In December 2015, HubShout conducted a survey of small to mid-size digital marketing agencies. 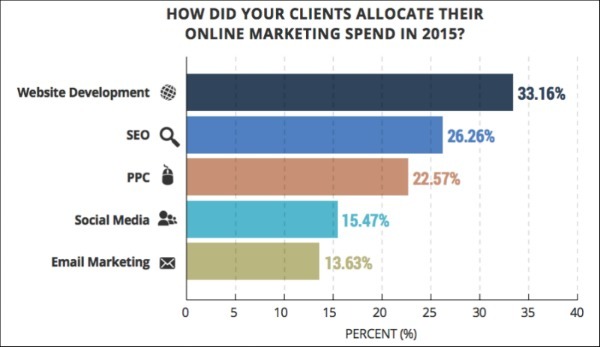 The data from the survey shows clear online marketing trends for 2016. Because we conducted the same survey the previous year, we are able show how 2016 online marketing trends compare to the 2015 trends. We begin with the top 2016 online marketing trends stats and compare year-to-year data in the sections below. The results of the online marketing trends 2016 survey will help digital marketing agencies be ready to offer the services that small businesses want in 2016 and either hire staff in anticipation of the workload, or consider outsourcing SEO and other in demand services to a white label SEO agency. The survey results also give agencies a good sense of what small business clients are prepared to pay for online marketing services this year. According to the US Small Business Association, there are 28 million small businesses in America and the small business sector is growing rapidly. 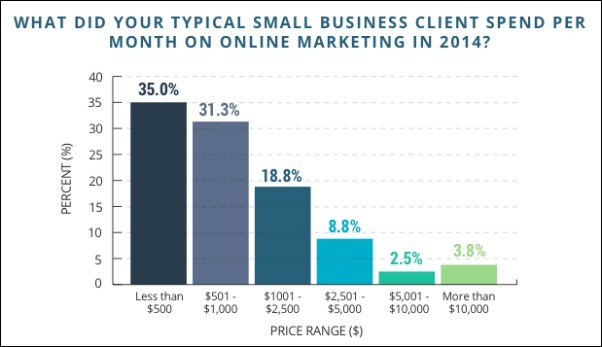 This 2016 online marketing trends survey looks at small business clients-- clients that typically hire the small to mid-size online marketing agencies that took part in this survey. This data from the online marketing trends survey helps agencies benchmark where they stand in relation to other small to mid-size agencies. Slightly more than half, about 51% of survey participants, reported revenue of less than $250,000. In terms of agency size, 58% had fewer than five employees. 2. More Money, More MONEY! In 2014, 35% spent less than $500 per month on digital marketing. 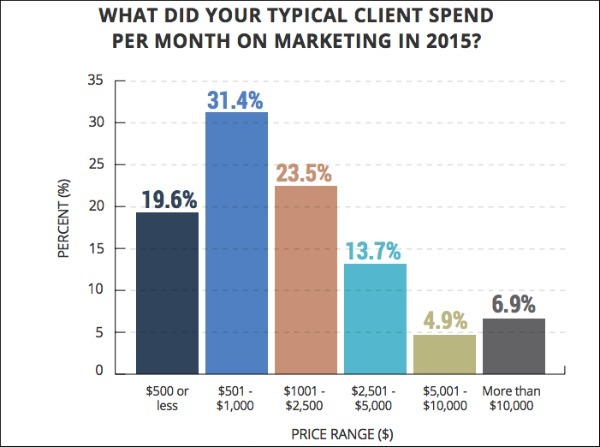 In 2015, only 20% of clients spent less than $500. 3. Where’d the Money Go? Small business clients are spending on all areas of digital marketing with the highest percentages of spend going to Website Development, SEO and PPC. Web development and SEO were strong in 2014 too. Last year’s survey showed that only about 12% of spend went to PPC; this year’s survey shows PPC at almost double that. and compare to last year’s stats to see the growth of PPC spend and the staying power of Website Development and SEO services. 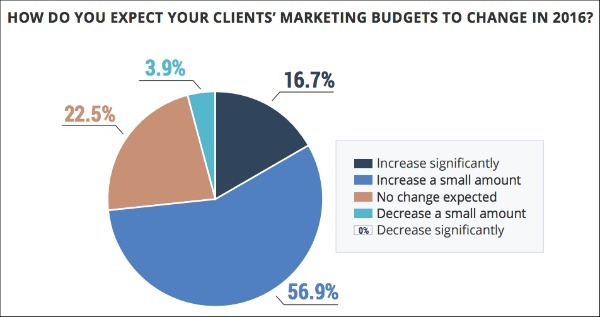 Very few agencies expect their small business clients’ budgets to decrease in 2016. In fact the reverse is true. Nearly 74% of the online marketing trends survey respondents believe their clients’ budgets will increase and 17% foresee a significant increase. And this year, no agency expects clients’ budgets to decrease significantly. In the online marketing trends survey, we posed this question: What services will be the most in demand for 2016? 56% predict that Website Development will be the one of the most in-demand services, 53% put SEO in the top three and 51% placed Content Marketing on that list. Download the eBook to see the other services that made the list. 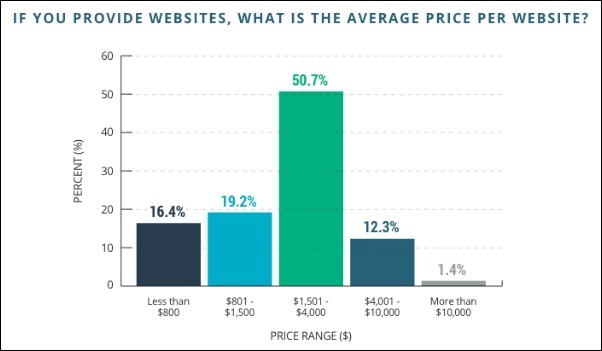 Spending too little on a website, i.e., less than what the average small business is spending on a website = BIG mistake. As shown in section 3, in 2014 and 2015, small businesses allocated the largest percentage of their budgets to website development. And in section 5, 56% or survey respondents predict that Website Development will be the one of the most in-demand services in 2016. 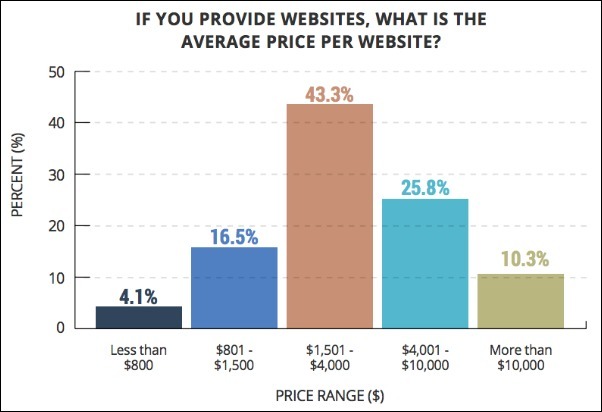 The price savvy business owners are willing to pay for a website is going up. If you’re selling websites, there’s plenty of work out there for you! Website designers/developers can use this online marketing trends survey data to help educate their customers on what they must do in order to compete with other business owners--the ones who are not trying to cut corners on web design. A 2014 study, showed that 97% of consumers search online for products and services but just 51% of small businesses had websites and many of those sites weren’t built for success. 71% didn’t even have a call to action! The online marketing stats tell us this about website design: So many small business owners now understand the value of a properly constructed website and they’re stretching the budget to pay for a properly constructed, mobile-friendly website. Those small businesses that don’t buy into that will end up with a website that will disappoint consumers. The 2016 online marketing trends stats indicate that most small businesses are now paying between $1,501-$4,000 for a website. That’s not a big change from last year. But there are notable differences in the online marketing trends stats about how much small businesses are spending on websites. In 2014, 36% spent less than $1,500. In 2015 only 21% spent less than $1,500. In 2014, 14% spent more than $4,000. In 2015, 36% spent more than $4,000. In 2014, 1% spent more than $10,000. In 2015 10% spent more than $10,000. P.S. Agencies that sell websites and provide white label SEO, are extra golden! Over the years, many agencies have learned to diversify. Website designers know that their clients need SEO. SEO professionals know that PPC can be a great supplement to an SEO campaign...and so on. The extra workload and responsibility of adding additional new services is often beyond what an agency can easily manage--which is why so many digital marketers outsource. It’s not surprising to see that for the last two years, SEO topped the list of services that agencies outsource because the Google algorithm updates can change the SEO rules at anytime. It’s just easier and less stressful to let a white label SEO agency with the most innovative SEO products handle it. In 2015, outsourced SEO was at the top, with nearly 67% of online marketing trends survey respondents reporting that they rely on an SEO reseller to manage their campaigns. to last year’s, it’s clear that the percentage of agencies that outsource SEO and other services is trending upward. In our online marketing trends stats survey we again asked digital marketers: What Will Be Your Biggest Challenge this year? And again, the number one answer: Leads. Same as last year. Some of our experienced SEO resellers have shared some of their great (and clever) lead gen ideas with us in our “Ask a Reseller” Webinar series. But let’s consider the other top challenges of SEO resellers/digital marketers. For the last two years, service/product effectiveness has landed in second place. Some SEO techniques that were once very effective are now...not so much. But that doesn’t stop some SEO agencies from pressing on with techniques that just don’t work anymore. SEO can only be effective when you understand the algorithm updates, change course as needed and develop groundbreaking and very effective SEO services like Featured News. 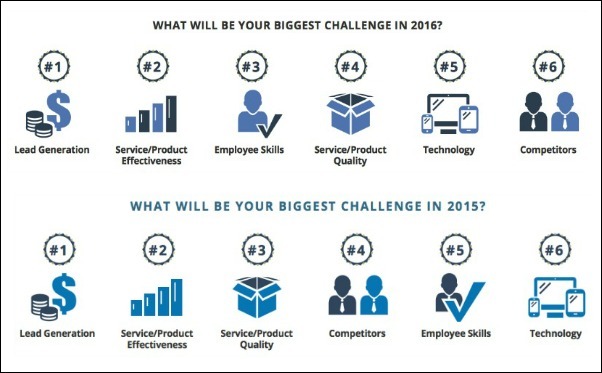 This year, employee skills moved into the top three. That can be less of a concern to agencies that outsource SEO or outsource PPC to an agency that has experienced, specialized personnel. Your industry peers say the top source for leads is referrals and second is SEO. Download the ebook to see the other strategies SEO professionals and digital marketing agencies use to generate new leads. Download the eBook to see the complete online marketing trends stats from the survey. 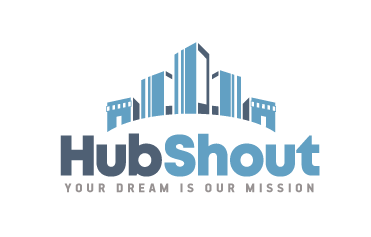 For more information about the survey, eBook or HubShout’s reseller program, please visit hubshout.com or contact HubShout at: 1-877-760-6524.